April 12, 2016 – Today marks the 55th anniversary of Yuri Gagarin’s flight. 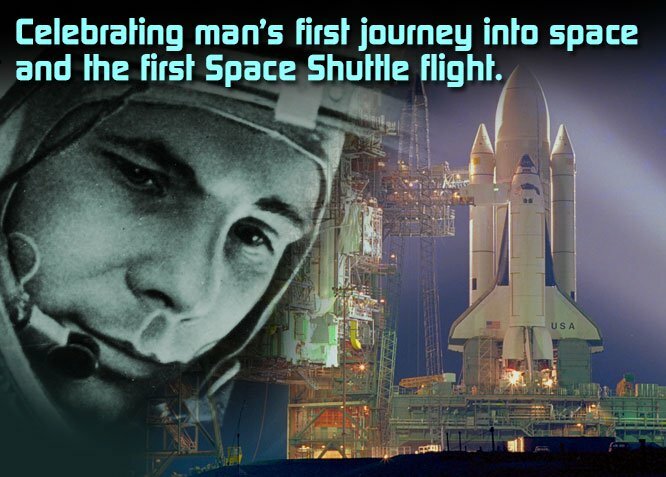 On April 12, 1961, Russian cosmonaut Yuri Gagarin became the first human in space, making a 108-minute orbital flight in his Vostok 1 spacecraft. “Circling the Earth in my orbital spaceship, I marveled at the beauty of our planet. People of the world, let us safeguard and enhance this beauty – not destroy it,” said Gagarin when he returned to Earth. A new era in space flight also began twenty years later, on April 12, 1981, when Space Shuttle Columbia soared into orbit from NASA’s Kennedy Space Center in Florida. Every year, Yuri’s Night events are held in hundreds of locations to celebrate these achievements in space travel. Events have been held in over 75 countries, on all seven continents, virtual words such as Second Life, and the International Space Station. Beginning in 2015, the Space Foundation started its own Yuri’s night celebration, which ushers in the return of the world’s leading space professionals to Colorado Springs for Space Symposium – the largest gathering of the space industry in the world each year. Proceeds from the Space Foundation Yuri’s night event support scholarships for students and educators to experience hands-on field trips to the Space Foundation Discovery Center. This year’s event was held on Sunday, April 10 at the Space Foundation Discovery Center in Colorado Springs, Colorado. Guests were able to view dramatic 3D images of Mars from the European Space Agency’s MarsExpress mission, Science on a Sphere presentations, and inspirational presentations, as well as enjoying the museum’s interactive exhibits. Each of the speakers touched on humanity’s intangible desire to explore unknown worlds. Human space exploration helps to address fundamental questions about our place in the Universe and the history of our solar system. It also helps to expand technology we use on Earth, creates new industries, and helps to foster peaceful connections with other nations. Increasingly, people are planning ways to live and work in space, beyond Low Earth Orbit. NASA has been building the world’s most powerful rocket which, when coupled with the Orion spacecraft, built by Lockheed Martin in Denver, Colorado, will carry astronauts on NASA’s Journey to Mars. Private companies are beginning to design and develop the infrastructure that will support humans on their quest to become a multiplanetary species. The technology and space systems required to transport and sustain explorers will drive innovation and encourage countless other opportunities. NASA will use the International Space Station as a test-bed and stepping stone for the challenging journey ahead. By building on what scientists learn there, NASA will be better prepared to send astronauts on long-duration missions and permanent expansion of human exploration. Explorers may use the Orion capsule to visit near-Earth asteroids and prepare humanity for its next step. “The ultimate goal is to get human boots on Mars – and we’re headed in that direction,” said May. Robotic exploration continues to deliver profound answers about our Universe by visiting far-off destinations, providing reconnaissance and collecting scientific data. As humans move into space, the need for robots will only increase as robots are used to provide reconnaissance, construct habitats, and various other needs that may not yet be apparent. Speakers at Yuri’s Night 2016 agreed that this is the beginning of a new era in space exploration.